Growing up on a farm, surrounded by plants and animals, can spoil you to the wonders of what a yard could hold. 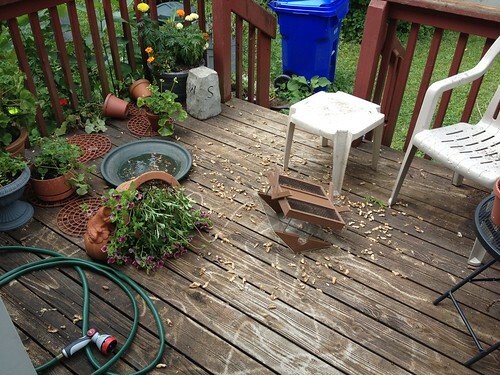 When we first moved into this house, I admit to trying to tame nature to be something it wasn't. Over the years, I've gone from seeing it as something of an adversary to a friend. I realized if I wanted to grow organic, I couldn't use synthetic pesticides or herbicides. If I wanted butterflies, and I remember clouds of them in the garden on the farm, I was going to have to call city hall and ask that spraying for mosquitoes occur sporadically, rather than every week. The pesticide used to kill mosquitoes was killing butterfly larva. A golf club yard isn't necessarily the most diverse and can be a desert for birds. It's taken awhile and I still have some things in the basement, like Round Up, which I use on tree stumps and to control the spread of Canadian thistle. I'm not feeding thistle seed to finches in my yard. Sorry birds, but you're messy and I want to be able to walk barefoot through the yard without stepping on those things. Gad that hurts. There are other foods I can put out which will be good and then I'm not wandering around with Round Up worried about the repercussions of spraying whole sections of yard for thistle. Such a mess. Fortunately, I could just sweep the shells off into the lawn but as much as it's a hoot to watch the squirrels take a couple of peanuts off into the back of the yard, it's not worth the morning mess. I like feeding peanuts but I make a pile on the tree stump where the raccoons and opossums can feast and not tip things over. One creature I had not seen in any form in years was this. It's a dragonfly. The body was irridescent green. The wings were black with hints of blue. 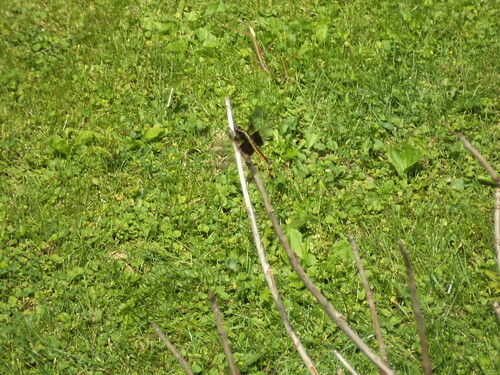 It's extremely hard to sneak up on a dragonfly to take a photo, but it flitted around the back for a good hour, alighting on various branches. I also had hummingbirds. I have to post those photos, as I work through all the photos I took last year which never got blogged. What I hope is getting the birdbath in the front fixed so it retains water and redoing where the birdbath is on the deck will encourage more dragonflies and hummingbirds and just wildlife in general to hang around the yard. I should look into suet posts and probably hummingbird feeders, too, but one step at a time. Sometimes, when I'm watching squirrel acrobatics to get into the north feeder, I think I should have done this years ago; kept it up when I had one feeder. One feeder got to be a chore. But you make choices about what you can do and I can do this now. It gives me immense pleasure. Now is when it will be done, then.